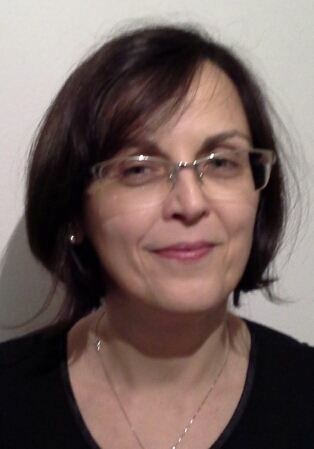 My name is Gordana Sutej and I am a teacher librarian at Ivan Goran Kovacic School, an elementary school in Duga Resa, Croatia. I am honored by the opportunity to share my thoughts about Guided Inquiry with colleagues around the world and grateful to Leslie K. Maniotes who encouraged me to write for this 52GID blog. I am enthusiastic about Guided Inquiry and trying to implement it in my school (it is K8 in US terms) and to spread the word about it to my colleagues in the district where I live and at the national level whenever possible. 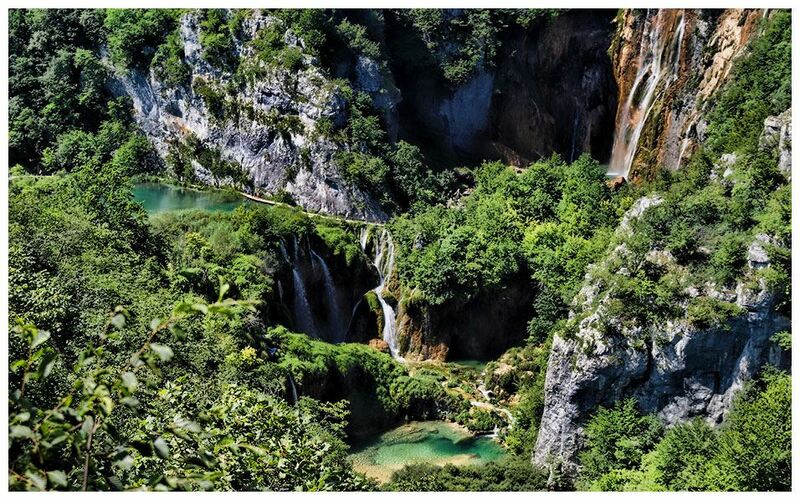 Let me say a few words about Croatia, first. It is a country in Southeastern Europe with national territory of 56 594 km2 (there are probably farms in Texas bigger than that 😊). 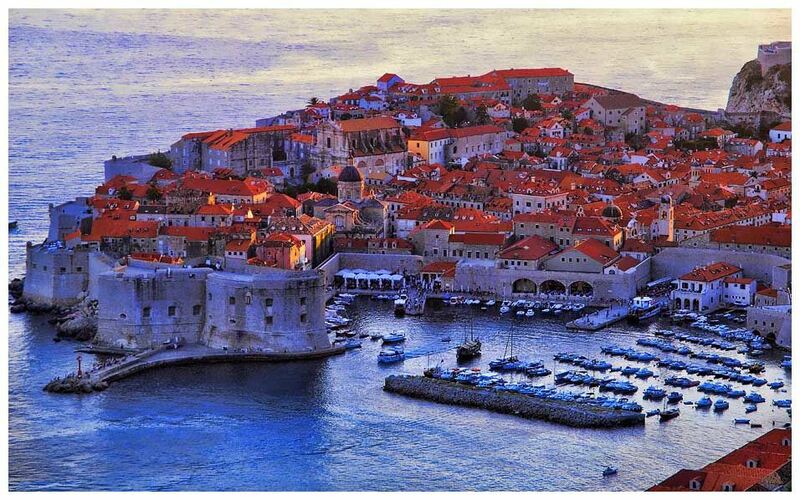 Although a small country, Croatia boasts with diverse and beautiful landscapes and numerous historical monuments. 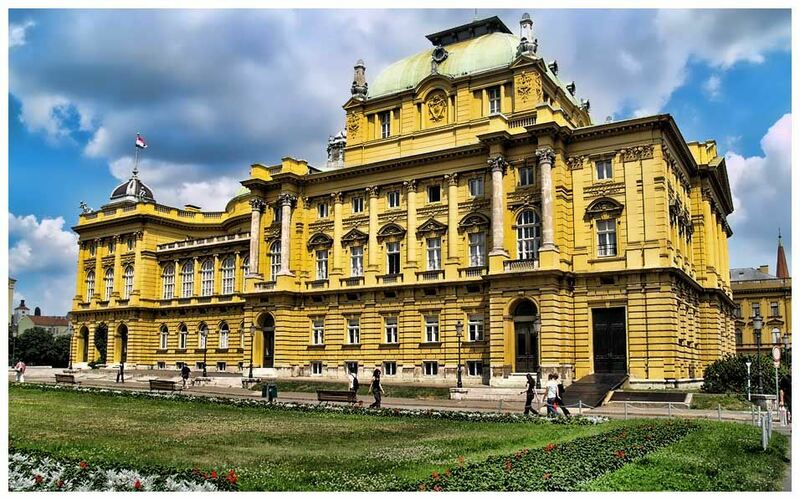 Photos of Zagreb and Croatian landscape by, Mario Fajt (sobrecroaCia.com.). We have a population of 4 million people. There are some 1200 school libraries here. Every school must have a library according to law. There are standards for school libraries, but government, who impose those standards do not secure financial means to fulfill the standards. Therefore, we have varied school libraries, ranging from excellent – spacious, well equipped with all sorts of resources and devices, to small ones lacking books, computers, and almost everything. School library where I work is a small one (70m2) with 4000 books, 3 computers, LCD projector and a smartboard. Although not big, it is comfortable and appealing space, and everything in it is selected with love and care. The school has 410 students and 50 teachers and other stuff members. Both students and teachers visit and use library often. I am happy that they enjoy spending their free time there, but they also like having lessons in the library. We have many extracurricular activities in school which are very popular with the students. I lead school journalist, a book club, library helpers and poetry academy groups. 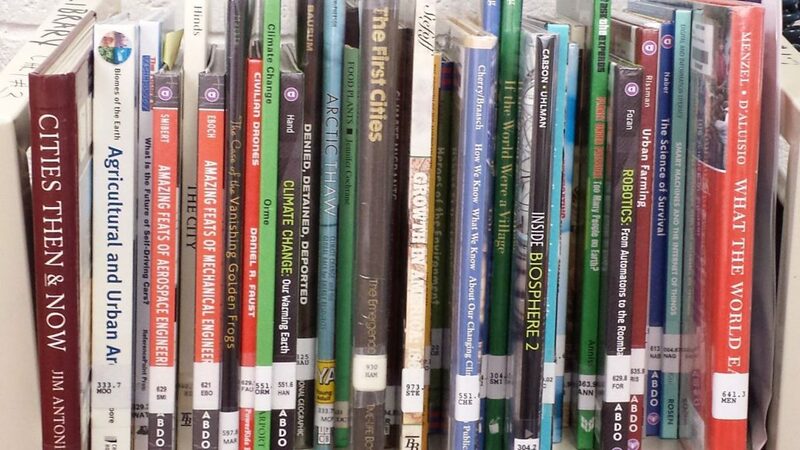 I started working in a school library in 1999, after seven years spent in a small public library in my home town. Discovering what are the possibilities of school library to help students become readers and critical thinkers was interesting, but not always easy. I wondered for a long time how can I accomplish to fulfill my responsibility for fostering information literacy in school if I do not give assignments to students and do not participate in evaluating their work. The answer came to me in a lecture by prof. Ivanka Stričević at our PD, Spring School, as we call it, in 2010. Prof Stričević said: “Kuhlthau says there is no point in teaching information literacy without context, it should be integrated into school curriculum and carried out through Guided Inquiry.” I did not know how to spell the name, Kuhlthau, at that time, but I managed to find it on internet, and since that day, I did not stop searching, discovering, learning about Carol C. Kuhlthau, her research, ideas, concept of Guided Inquiry she developed together with her daughters Leslie K. Maniotes and Ann K. Caspari. Their work Guided Inquiry: Learning in the 21st Century is not translated to Croatian, it cannot even be found in our National Library. The only way to get it was to order the book from USA. What a thrill it was to read it. I believe you know the feeling when you read astonishing text and you cannot believe afterwards that the world is still the same. You ask yourself, why does not everybody read it and take it seriously? 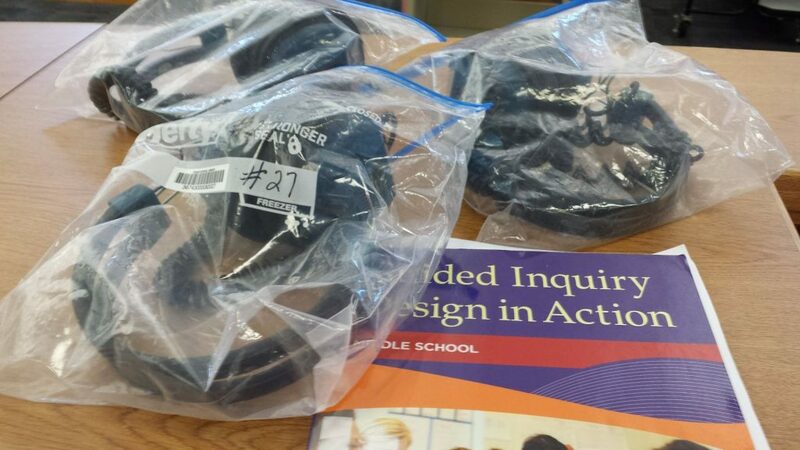 Why do we not transform our schools according to Guided Inquiry Design? It is so clever, so logical, so true! How cannot everybody see it? Anyway, I made a pledge to do everything I can to make it work in my school. Hi again! I’m sorry for the late posting. Perhaps I should rethink posts during the first full week of classes in the future! I am going to share the unit, as it was written out during the collaboration between the classroom teacher and me. The unit begins with an overview, continues with a list of all standards that we addressed over the 20 days, and concludes with a day-by-day description of activities. In this unit, that is co-taught daily by the classroom teacher and the teacher librarian (TL), students will learn the purpose behind the creation of national parks. They will begin by learning what it means to preserve something. They will then visit Kings Canyon National Park and learn about the flora, fauna and geological features that are being preserved within the park boundaries. This will begin with a focus on preservation of the Giant Sequoias. However, after learning about this park and what it is tasked to preserve, students will explore other national parks and learn about the unique features they are preserving. Students will identify a plant, animal or geological structure that is being preserved that they find exciting. The students will then learn to write a research question about the topic they have identified. They will then engage in individual, personalized research to learn about the preservation of their topic. Students will be introduced to a variety of creative presentation methods. They will choose one of those, create a product to present their topic, and share their research in a gallery walk that will be attended by community members. Students will identify solutions for the impact of humans on the preserved lands of the national parks. RI 1. Ask and answer questions to demonstrate understanding of a text, referring explicitly to the text as the basis for the answers. RI 5. Use text features and search tools (e.g., key words, sidebars, hyperlinks) to locate information relevant to a given topic efficiently. W 2. Write informative/explanatory texts to examine a topic and convey ideas and information clearly. a. Introduce a topic and group related information together; include illustrations when useful to aiding comprehension. b. Develop the topic with facts, definitions, and details. c. Use linking words and phrases (e.g., also, another, and, more, but) to connect ideas within categories of information. d. Provide a concluding statement or section. W 6. With guidance and support from adults, use technology to produce and publish writing (using keyboarding skills) as well as to interact and collaborate with others. W 7. Conduct short research projects that build knowledge about a topic. W 8. Recall information from experiences or gather information from print and digital sources; take brief notes on sources and sort evidence into provided categories. SL 6. Speak in complete sentences when appropriate to task and situation in order to provide requested detail or clarification. L 2. Demonstrate command of the conventions of standard English capitalization, punctuation, and spelling when writing. L 3. Use knowledge of language and its conventions when writing, speaking, reading, or listening. a. Choose words and phrases for effect. * b. Recognize and observe differences between the conventions of spoken and written standard English. History 2.3. Students explain governmental institutions and practices in the United States and other countries. History 2.5. Students understand the importance of individual action and character and explain how heroes from long ago and the recent past have made a difference in others’ lives. Science 2-LS4-1: Make observations of plants and animals to compare the diversity of life in different habitats. Students will utilize a variety of resources in researching a specific topic. Students will collect and synthesize data. Students will use presentation tools to share information with others. 1.2 Formulate appropriate questions: a. Identify a problem that needs information by asking how, what, where, when, or why questions. i. Identify types of media and digital delivery devices. j. Use guide words to locate information in a reference book. k. Perform a keyword search of a topic by using an approved search engine or database. p. Locate information in text by using the organizational parts of a book in print or digital format (e.g., title, table of contents, chapter headings, glossary, author notes, dedication, index). 2.1 Determine the relevance of the information: a. Select information appropriate to the problem or question at hand. b. Determine whether the information answers the question. 2.2 Assess the comprehensiveness, currency, credibility, authority, and accuracy of resources: a. Identify copyright and publication dates in print resources. 2.3 Consider the need for additional information: a. Locate facts and details to support a topic sentence and paragraph, and record the information. 3.2 Draw conclusions and make informed decisions: a. Compare information from more than one source to draw a conclusion. 12 grade three 3.3 Use information and technology creatively to answer a question, solve a problem, or enrich understanding: a. Organize information chronologically, sequentially, or by topic. b. Select appropriate information technology tools and resources to interact with others for a specific purpose. Guiding Question: What do national parks preserve? Day 1: Students will be introduced to the idea of “preservation.” The teacher and TL will show them the pictures of “preserved” items that grace the home page of this KBC. The teacher and TL will also bring in realia for the students to view. Students will look over the pictures and work with their table group to figure out how the seemingly disparate items might be connected. After students have worked on this, the teacher will bring them back together and allow groups to present their suggestions. The teacher and teacher librarian will show the class a peach and ask “why do we can these instead of just eating them like this (fresh)?” The expected response is that we can them to keep them from rotting so we can eat them later. The teacher and TL will then discuss the other two items (old pictures and mummies), working toward the same outcome: we preserve them to so that they will be available to us later. The pictures represent keeping memories of loved ones alive. The teacher will write the word “preservation” on a poster board that already contains examples of the canned fruit and old pictures. The TL will direct the students to Google Classroom where they will write a journal entry explaining why preservation is important. Day 2: The teacher will show students a peach that is starting to decay. She will tell them that this is the peach they saw the day before. It can be a different, older peach. The kids just don’t know that. The TL will ask: Since we didn’t eat the peach yesterday, it has begun to rot. What can a farmer do with the peach right now so that it will still be useable next week? The expected response is that the farmer could can the peach to preserve it. If the students do not provide the term “preserve,” the TL and teacher will gently remind them by pointing to the poster that was created the prior class session. The teacher will then tell the class that there are actually many other things that can and should be preserved. Today they are going to hear a story about someone that worked very hard to make sure that land was preserved in our country. The TL will provide a picture of John Muir for the class at this point. She will ask the class if the picture looks like something they have seen before. The expected response is that it looks similar to the old pictures from the last class session and from the poster at the front of the class. The TL will say that, yes, this is a picture of someone who isn’t alive any longer, but we preserve his memory with his picture and through books. Today they are going to hear a story all about this man, John Muir. At the end, they will understand why we preserve his memory. The teacher will then read The Camping Trip that Changed America to the class. After the story, the TL will direct the students to their Google Classroom where they will find a graphic organizer (GO) in the form of a Google Document. The students will work with their elbow partners to complete the parts of the GO. Day 3: The teacher and the TL will provide students with printouts of their GOs from the previous session. They will then ask students to stand and use the Give One, Get One model for reviewing and sharing information. Music will play and students will move randomly around the classroom. When the music stops, students will pair up with the person closest to them. The teacher will tell the class that the student with the shortest hair will go first. That student will share one piece of information that they have learned about preservation with their partner. The partner will look at their GO and add the information if it is not already on their page. The partners will then switch and the longer haired student will share while the partner adds information to their own GO. This will be done two more times so that every student speaks to at least three partners. The students will then return to their seats. They will open Google Classroom and respond to a quick write journal in a Google Doc. The prompt will be: Three things we often preserve are: food, memories, and land in national parks. What are some reasons you think these types of preservation are important? Day 4: The TL will share a slideshow of pictures from Kings Canyon National Park with the class. Several of the photos will focus on the Giant Sequoias, the keystone plant species of that park. The teacher and the TL will take turns returning to those slides and demonstrating awe at the size of the trees to generate interest in the students. They will tell the students that the trees are larger than they can imagine. In fact, they are much larger than the trees at school. They will then take the students outside to look at the size of average trees in the landscape. Each student will be provided with a piece of yarn that is exactly one foot long and a graph on which to record the measurement of tree girths. One column of the graph will ask students to measure how many students it takes, holding hands, to circle the tree. They will be broken into teams of four based on their table groups. Each group will be assigned to one of the trees that border the playground. The teacher and the TL will model the use of the strings to measure around the trunk of the tree. They will show the students how to estimate ½ foot measurements. They will model writing their measurement on a poster-sized chart like the ones the students have. They will also model measuring around the tree by holding hands to circle the tree. Students will then work in teams to measure the girth of their tree and record the measurement on their charts. The teacher and TL will circulate, assisting students as necessary. If time allows, each group will measure and record two trees’ girths. Once back in class, each team will share their measurements and the teacher and/or TL will add them to the poster-sized chart. Day 6: Students will look over their note-taking sheet from the field trip. They will be given time to add items that they might have thought of since returning from the park. The teacher and TL will each share some of their own thoughts as examples for students who struggled to complete the handout. The teacher will then tell students that now that they’ve experienced Kings Canyon National Park, they will get to learn more about preservation in this or another park. Today will be the first day of a multi-day exploration research phase. The students will have access to a variety of library print resources that the TL provides. They will also be sent to Google Classroom to access a Symbaloo that the teacher librarian has created. The Symbaloo will provide direct links to a variety of national parks that each preserves a specific flora, fauna, or geological feature. It will also include links to information about some of the flora and fauna being preserved within Kings Canyon National Park. Lastly, for the purposes of lower the affective filter of our newcomer (immigrant) students, there are links to national parks in both Mexico and El Salvador, the newcomers’ countries of origin. The students will spend Days 6 and 7 exploring all of these links, looking for the national park preservation topic that interests them the most. In order to keep them focused, the students will fill out a GO that is aligned to the Symbaloo links. The teacher and TL will monitor and assist with technical issues if they arise. Day 7: Students will continue to explore preservation topics using the Symbaloo. They will continue to fill out the GO as they explore each link. The teacher and the TL will monitor and assist with technical issues if they arise. Day 8: Today is the final day for exploration using the Symbaloo links. Students must turn in their completed Symbaloo GO at the end of today’s exploration session. During the final ten minutes of the class session, the TL will direct the class to Google Classroom. They will complete a Google Form in which they will identify the flora, fauna or geological structure around which they want to focus further research. Day 9: Turning interest into a research question. Teacher and TL demonstrate and provide sentence starters. Day 11: Research continues. The teacher and teacher librarian will continue to add resources daily that they find to the list on Google Classroom. Day 12: Research continues. Individual meetings with teacher or TL to verify that research can answer a question or to revise the question. Day 13: Research continues today. The TL will review strategies for Google Searches. This is something the students have done all year, so it will be a very brief review. Although the teacher and TL have been providing links to specific sites for students to use, today is a day that the students can branch off and search on their own using Google. Day 14: Today is the final day for students to complete their individual research assignments. Day 15: Students will use Days 15 – 18 to create a presentation about their individual research topics. Today the teacher and the TL will present examples of the project choices to the students. The students will be allowed to choose from a variety of projects for their creation. The creation must highlight the need for preservation of the chosen topic. The teacher and TL will provide materials that students can use to create a poster or a diorama. The students could also choose to create a video about their topic using Flipgrid, an online video making tool to which the TL has account access. The final project that the students can choose from is a Google Slides presentation. The teacher and the TL will both assist students as needed. Day 16: Today the students will continue to create their project. The teacher and the TL will both assist students as needed. The teacher and the TL will continue to bring in needed supplies as they are identified. Day 17: Students will continue to create their project today. The teacher and the TL will both assist students as needed. Day 18: Today is the final day for the creation of projects. All projects will be due at the end of this session. Day 19: The students will present their projects in a gallery walk format. The site administration and parents will be invited to the event. Invitations will be sent home via flyers as well as through announcements on the library’s Twitter feed and Facebook page. Students will display their projects and answer questions as the guests walk through the room. Day 20: Today the teacher and the TL will introduce the Big Think question. Students will work in their table groups to respond to the solution prompts. Although students researched different items being preserved, all of them are in some way affected by the human population. My name is Kristi Mulligan. I am a Teacher Librarian (TL) in Selma, California. I work at two elementary schools that serve a combined total of approximately 750 students. I am one of six TLs employed by the district. Last spring, we attended a GID training, presented by Leslie, in our district. Under the direction of our District Library Media Coordinator, Maria Petropolis, our team has elected to make GID the model for research with our students. I first became aware of the inquiry process nearly 20 years ago through my experiences as a high school agriculture teacher. At that time, I used a very abbreviated version of an inquiry process to engage my high school students in research and, looking back on it now, very limited individualized learning. As a TL, I have found that the GID process, as outlined by Leslie and her team, provides a structured and balanced approach to research. Since our training last spring, I have used all or part of GID with students as young as first grade and up to sixth. I know another colleague is very excited about pursuing research with her high school students this year using this process as well. In subsequent blogs this week, I will be reflecting on the use of GID with a second grade class last spring. The classroom teacher and I collaborated and co-taught a unit focused on the preservation of land through the national park system. The teacher’s annual field trip to Kings Canyon National Park was the impetus for our unit. In years past, she taught her students, through traditional whole group instruction, about the park flora and fauna, with a focus on the Giant Sequoias. She then took her class to the park where they viewed those magnificent trees, went back to school and had them all write a selection about the field trip, and left that learning behind to move on to something else. After attending the GID training, we decided to drastically revise her previous efforts. That revision will be the focus of my future posts. For most of our students, OPEN, IMMERSE, and EXPLORE were really positive, and inquiry circles were a big hit. As librarian, I visited as many classes as possible during these phases, to listen, brainstorm, coach, and teach mini-lessons at teacher request. This exposure enabled me to share what was going on in other classes, which helped build excitement and a sense of a common goal. A student stopped me in the hallway with: “Mrs. Little, when are we going to work in our inquiry circles again? I really like that part!” Students coming into the library to grab books or headsets were happy to chat about what they’d learned, and where they were going with it. There was a lot of energy, and a sense of pride and purpose. As we approached IDENTIFY, some students struggled to find a focus, and I was able to tag-team with the ELA teachers, to participate in some of those conversations, either in the classroom or the library; a student would appear, saying: “My teacher said I should come down to talk to you about my research question” (music to a librarian’s ears!). Knowing the ISP helped us to anticipate emotions, and assure students that they were moving in the right direction when they were frustrated or confused. As our students settled on their research questions, we collaboratively curated resources that might be useful, and shared the Google Doc through Google Classroom. 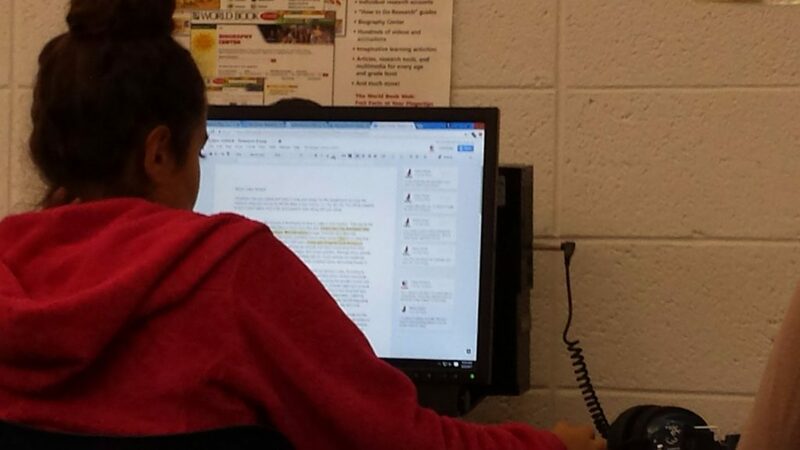 Only teachers could edit the Google Doc, but students could suggest sources, and teachers vetted them. GATHER had our students diving into books (print and digital), database articles, and websites that we’d found together. At this point, from here on out, through CREATE, SHARE, and EVALUATE, the ELA teachers definitely felt more comfortable – this was familiar territory! Our team met with our supervisor at the end of the year to evaluate the project. We had no shortage of ideas about how we could improve the project for next year, but there was a lot of enthusiasm for the process. Our end-of-project student reflection showed our students liked working in groups, choice (“learning about our OWN topic instead of a topic teachers picked”), the IMMERSE activities, and found working with their inquiry circles and talking with their teacher/librarian about the project to be very helpful. For me, GID was a long time coming, but it was worth the wait. Every teacher brought their own talents to the table as we worked on our session plans together. Some were excellent at locating resources, some liked writing the session plans, and all imagined the project through the eyes of their students, and suggested ways to adapt it for their students’ needs. Everyone came up to speed on the topic more quickly because we worked together – just like what we hope for when our students work in inquiry circles. We spent most of our planning time on the OPEN, IMMERSE, and EXPLORE phases, and so we entered those phases with materials and activities in hand. Teachers didn’t march in lockstep through the project, of course, but it gave everyone a framework they could refer to along the way. 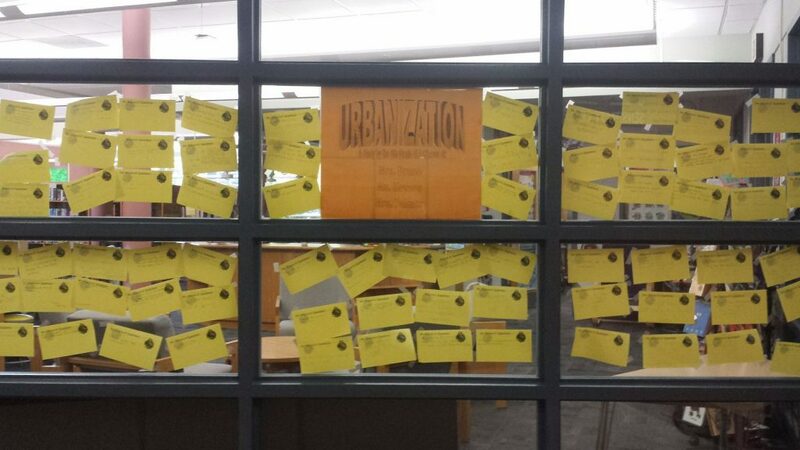 The “Open” part of our Urbanization Unit was probably my favorite. 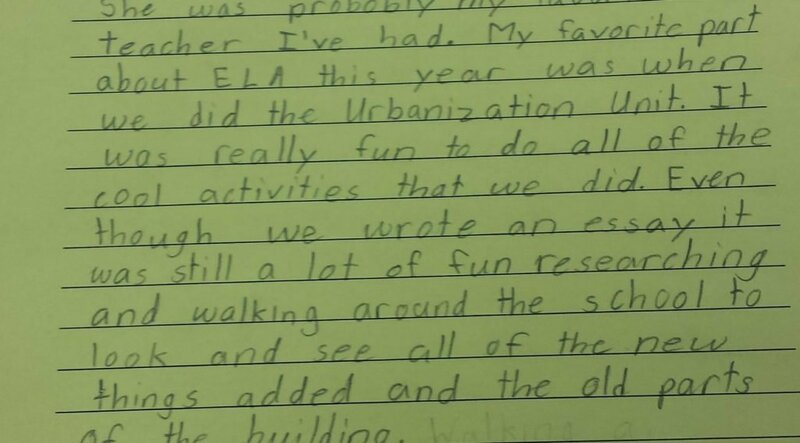 Listening to my students be such little experts about their town was so impressive. I couldn’t believe how knowledgeable they were about the history of Metuchen. It was clear that their parents explain ideas to them like taxes and population increases, and they went on and on about what a great town they live in. They were so proud of their downtown appeal, the family oriented sense of community that has been established here, and their reputation for being “The Brainy Boro”. 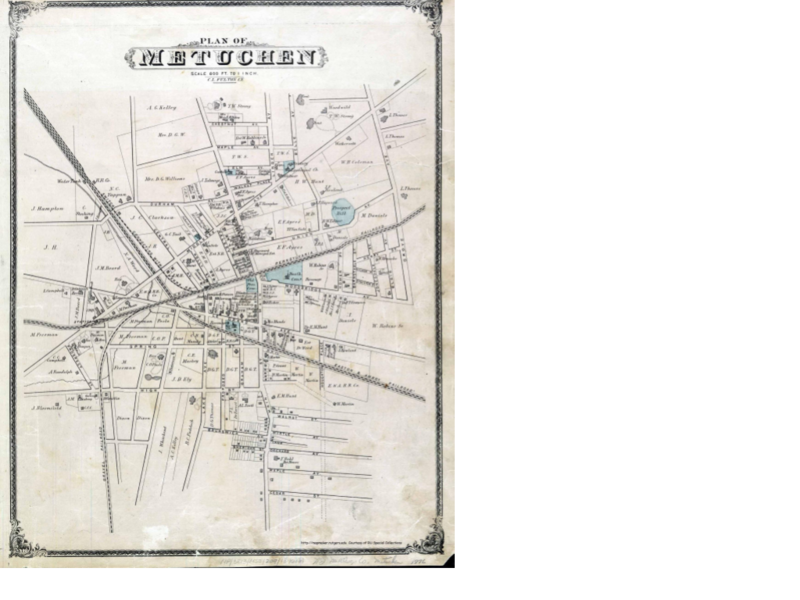 We looked at maps of Metuchen over the years from the 1800’s to a more current map. Something that sort of took me by surprise was when it was evident that most students really weren’t familiar with reading maps. Once they understood what they were seeing, they were really intrigued and made some great insights about how the town has changed over the years. We also did a walk around the school to see how the building has changed over the years. The students identified how there are different bricks indicating that there are additions to the building, and there are new lockers that were clearly an afterthought because they don’t match the lockers already in place. In our “Explore” phase students were in groups reading articles about the subtopics of urbanization. This was so well organized by the team of teachers who put this together. It went seamlessly, and the students were really interested in all of the topics. Some of them even cheered when I gave them the folder for “Trends in Migration” (I was in shock). Ideas that I thought they would be totally bored by, they were excited! I have to say… I did have an exceptional class of 6th graders this year who are very task oriented, people pleasing, high achievers. However, I was still pleasantly surprised they were interested in the topics as they were. When it came time to get even more specific and come up with their research questions, I was again impressed with the variety and specificity they came up with for questioning. They were interested in animals, war, drones, flying cars, city gardens, and so much more. One of my students even wrote a paper about how advancements in technology for cities with apps like Uber have decreased the number of DUI’s in a certain city. There were some students who really went above and beyond, and then there were some students who were pretty basic and surface level with their research with little insight. But that’s sixth grade in a nutshell! Some kids are just more engaged and capable of taking it to another level, and some of them just aren’t there yet, and I’m really okay with that. I was happy that they found a topic they were interested in and worked start to finish. The Gather phase required lots of flexibility, since so many students needed to share resources, and technology was at a premium, because we were in the midst of standardized testing. We spent a lot of time negotiating for the use of laptop or Chromebook carts (and not always successfully). Books were on a cart that stayed in the library, and students came down to borrow them as needed. Amazingly, we didn’t misplace one book or headset in the process! Everyone seemed to understand that other classes were working with these materials – there was definitely a sense of a community of learners throughout the 6th grade. Metuchen is a lovely historic town in central New Jersey, at the crossroads of transportation in our state. Metuchen is a small town, encircled by Edison Township. Just how small is it? Even lifelong NJ residents might not know exactly where it’s located! Some people may recognize Metuchen as a stop on NJ Transit’s Northeast Corridor line, an exit on the New Jersey Turnpike, Route 1, or Interstate 287. Metuchen has a walkable downtown, and tons of local character and community spirit – arts & craft festivals, parades, community programs for all ages at the local public library, summer programs at the schools, the list goes on! Metuchen is proud of its history, and protective of its tree-lined streets graced by historic homes – the tree canopy is even protected by local ordinance. Our District has four schools, with Edgar Middle School as home to 750 students in grades 5-8. Edgar School sent a team of four to the 2016 CISSL Guided Inquiry Summer Institute at Rutgers University: Dr. Tiffany Jacobson, then-Supervisor of English & Social Studies; Melissa Kovacs and Kristin Bruno, 6th grade ELA teachers; and Maryrose Little, librarian (me! ), with the intention of designing a 6th grade ELA curricular unit to be used in the spring of 2017. How did we find ourselves at CISSL Summer Institute? The short answer: an amazingly supportive, approachable, and open-minded principal and supervisor. The longer answer: a long and circuitous route that began in 2008, when I first learned about Guided Inquiry Design in the Rutgers MLIS program. In my mind, Guided Inquiry Design is not a solo act. In my first SLMS position after graduation (‘08), I didn’t manage to find a collaborative partner willing to dip his/her toes into GID with me, so Guided Inquiry lived only in my head and on my librarian bucket list for years. It was kept alive by sessions at our NJASL annual conference, where I listened to other school librarians describe their collaborative partnerships, and how their students benefitted from Guided Inquiry experiences. “Maybe someday”, I thought wistfully, with a touch of envy. When I moved to Metuchen’s Edgar Middle School in 2014, I looked across all four grades to try to understand how research was taught – from our 5th grade Explorers project to the 8th grade ROGATE program. Over time, I spoke with administrators, librarians at our other schools, teachers, and our Director of Curriculum about how we teach our students to perform research, K-12. Did I mention I love research? 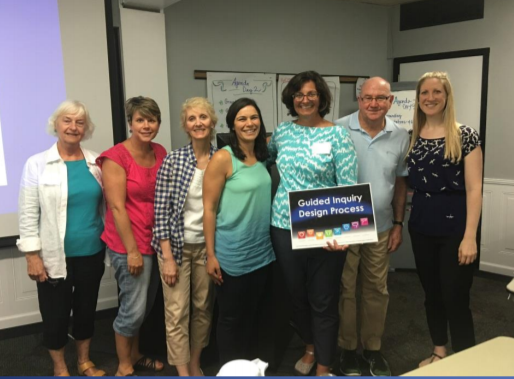 Along the way, I read Guided inquiry design : a framework for inquiry in your school, and peeked in on Dr. Maniotes’s edWeb webinars, where I learned another CISSL GID Summer Institute would be offered in July 2016. Maybe someday was here! But how to make that happen for us? My principal Kathy Glutz listened patiently and thoughtfully as I described Guided Inquiry, then suggested I reach out to Dr. Tiffany Jacobson, our ELA and Social Studies Supervisor – what better content areas? Dr. Jacobson invited me to join in curriculum mapping with the 6th grade ELA team, who hadn’t yet mapped their non-fiction text unit, and we continued to talk about Guided Inquiry – what grade, teachers, and content area made the most sense to approach? Ultimately, Tiffany asked me to describe Guided Inquiry and the CISSL Summer Institute to the 6th grade ELA team during one of our mapping sessions. I spoke briefly, showed the team this blog (thank you, Leslie and bloggers! ), and floated the idea of attending the upcoming Summer Institute. Our facilitator, Deanne Opatosky, hadn’t previously heard of Guided Inquiry, but she immediately recognized its value, and made connections to our locally-developed Metuchen Common Research Cycle used at our elementary school. Of the teachers who expressed interest, two were available during July: Kristin Bruno and Melissa Kovacs. All the stars had aligned in Metuchen, and it looked as if we were heading off to the Summer Institute! Well, not so fast – there was that pesky little detail of actually applying! We brainstormed to come up with a topic that our students might find interesting. Most of us didn’t know the term “Third Space” yet, but we knew enough to make a start. We thought about Metuchen’s history and current local “issues” – what kinds of things might families be talking about over dinner? 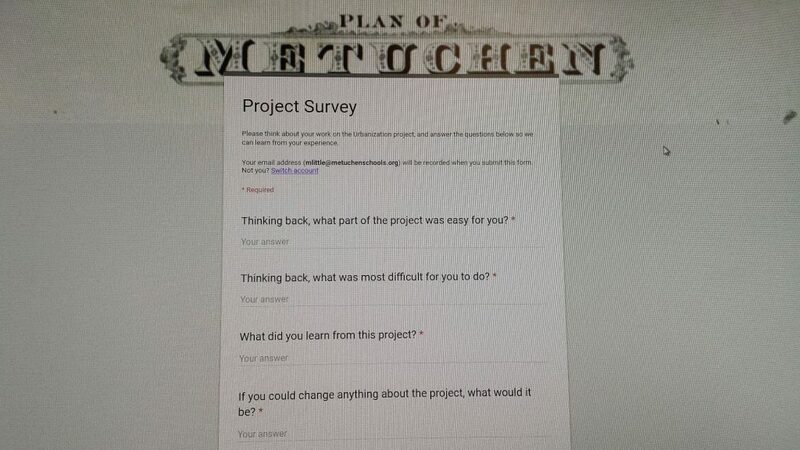 What was going on in Metuchen that our students might care about? None of us live in town, which made it a bit tricky, but something we see daily is our school bursting at the seams – there are not enough classrooms for our student body, plus there’s more building going on in Metuchen. Is the lovely little history-laden town going to lose its small-town feel? Is the character of Metuchen, which keeps families living here generation after generation, changing? We chose ‘Change’ as our idea, wrote our proposal, mailed it off, fingers crossed, and were thrilled to learn we’d been accepted! CISSL Guided Inquiry Design Summer Institute was an amazing experience – if anyone reading this is on the fence, go for it! We were treated to an opening which included Dr. Kuhlthau’s review of her career and findings, which powerfully set the stage for our learning. Every librarian in the room knew what a treat this was; by the time she’d finished speaking, so did everyone else. We worked hard over our 3 days, and by the time all was said and done, our ‘Change’ theme had morphed into ‘Urbanization’. Additional curriculum-writing time over the summer resulted in a 8-10 week curriculum unit, intended for use by all 6th grade ELA classes. 180 student researchers at once! An ambitious plan for what we hoped would be a powerful learning experience. Our unit was set for 4th marking period – no pressure, right? Our September and November in-service days were spent with other teachers who were interested in inquiry-based learning – an opportunity to share what we’d learned at the Institute, but had yet to practice in the classroom. But how could we bring the rest of the 6th grade ELA team fully on board with GID and our unit? As marking period 4 approached, we asked for one day to meet to hash out all the remaining details, and give ELA teachers who hadn’t attended the Institute time to wrap their minds around the process and the curriculum unit. At the end of that day, we had well-defined session plans for Open, Immerse, and Explore, including resources to share. Fourth marking period was then upon us, but 6th grade PARCC testing and spring break caused our 8-10 week long unit to be pared down to 7 weeks. At the beginning of May, we boarded the GI train, each of us feeling various amounts of trepidation and preparedness, but curious to see where the journey would take us. Details of our adventures in coming posts! 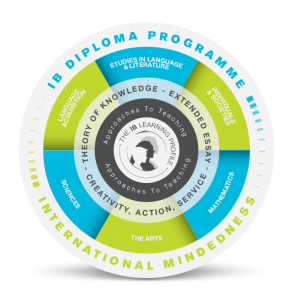 The International Baccalaureate is a global curriculum and one that we proudly offer at our school. Very recently I became the Extended Essay Coordinator. As you will note in the image below, the Extended Essay is part of the core of the Diploma Program of the IB. It is one of the few occasions that students are able to pursue a topic that they are interested in. It is the perfect foundation for the implementation of Guided Inquiry Design. The Extended Essay is a 4000 word academic piece of writing centring around a question based on one of the subjects that the student is currently studying. The student needs to have enough background knowledge to tackle the topic in depth. Students are allocated a supervisor (based on their topic) at school who will spend about 4 hours over the course of the year, guiding and intervening as necessary and various stages of the process. 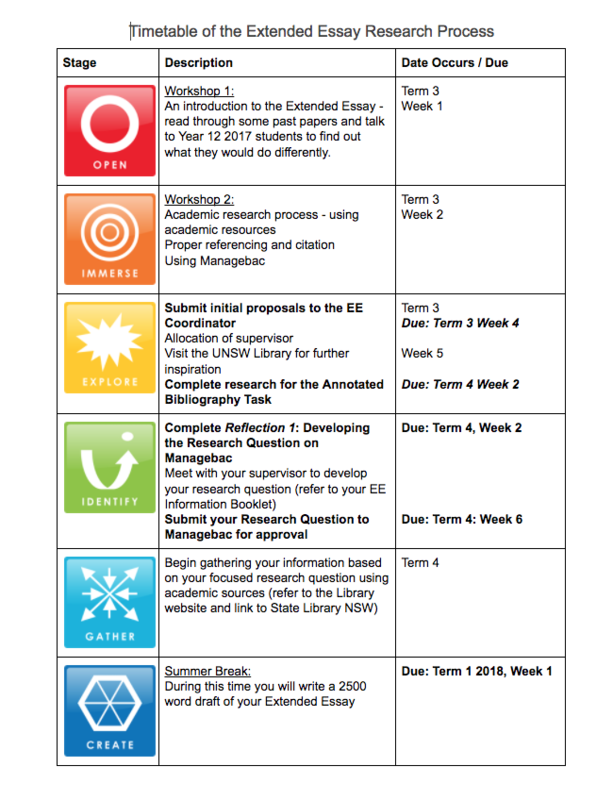 As you will note in the document below, using the various stages of Guided Inquiry breaks up the year long project into manageable steps. We begin our journey one year before it’s due date. Students are presented with the Extended Essay (Open) and asked to engage with all of its possibilities. We spend a couple of weeks immersing the students in the EE, walking through the potential for different topic areas, we concept map different ideas, they talk to teachers and do a lot of reading before submitting a proposal of potential topics. We need to do this quite early in the process to ensure that we can allocate a supervisor to support them through their journey. One of the most difficult parts of the process is the Identify step, where students are required to narrow down their topic to a specific research question which will guide them through the rest of the research process. In order to get there, we ask students to undertake a literature review during the Explore phase, which requires them to annotate at least four sources of information. This has the double effect of ensuring that their topic has enough background information to formulate a question and identify where their extended essay is going to go. Note, that we often go back to this step during the process because as we all know, often our research starts in one area and ends in another. The reflection process is incredibly important to students at these important points in the process because it enables them to understand their own thinking and make steps in taking the next step in the process. It also allows supervisors to intervene and offer guidance, make suggestions, and help students move on in the inquiry process. 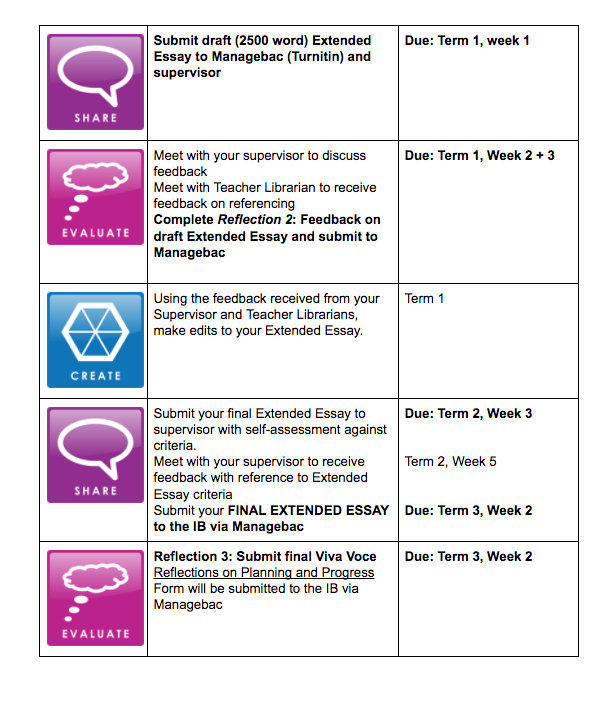 We use a system called Managebac, which easily allows students and supervisors to communicate throughout the process, while also scaffolding the reflection process. After identifying their question, students spend a whole term gathering sources of information that will help them answer their question. This allows them to conduct primary and secondary research while at school and gain support and guidance from teacher librarians and their supervisor. We ask that they write a big chunk of their essay (create) over the Christmas (long summer break in Australia) holidays, which then allows us to provide some feedback and guidance on the direction of the extended essay. You will see that at the end of the process (which actually takes about six months), students are in a revolving door of creating, sharing and evaluating their work. We repeat this process at least once, allow students to self-assess and make changes before submitting the essay to be externally marked. Students are required to be highly independent during this process. This is their work and close marking is not allowed by supervisors or teachers. This is why Guided Inquiry Design is so important in scaffolding the process for students. I welcome your questions and comments about this and would really like to hear how other teacher librarians use Guided Inquiry Design in the Extended Essay!